Collections Manager Timothy Walsh holds a 200-million-year-old semnionotus fish fossil, as part of a collection of recently donated fossils at the Bruce Museum Tuesday. GREENWICH — Two hundred million years ago. land that is now in central Connecticut and Massachusetts was along the edge of the Atlantic plate and subject to a completely different climate pattern than today. Those fish would die and settle into the sediment, or become an easy meal for opportunistic predators of the time — dinosaurs, which would leave their tracks on the shoreline. McDonald spent his career studying fossil evidence of that ancient food chain, preserved in Connecticut’s deep rift valley. Recently retired from his position as a teacher and chairman emeritus of the Science Department at Westminster School in Simsbury — the institution McDonald credits for fostering and supporting much of his research for 37 years — he is donating his entire collection of fossils to Greenwich’s Bruce Musuem in hopes of inspiring young people, adults and budding scientists to go outside and explore. Since finding his first fossils growing up in Mystic, McDonald has dedicated his life to leaving no stone unturned. 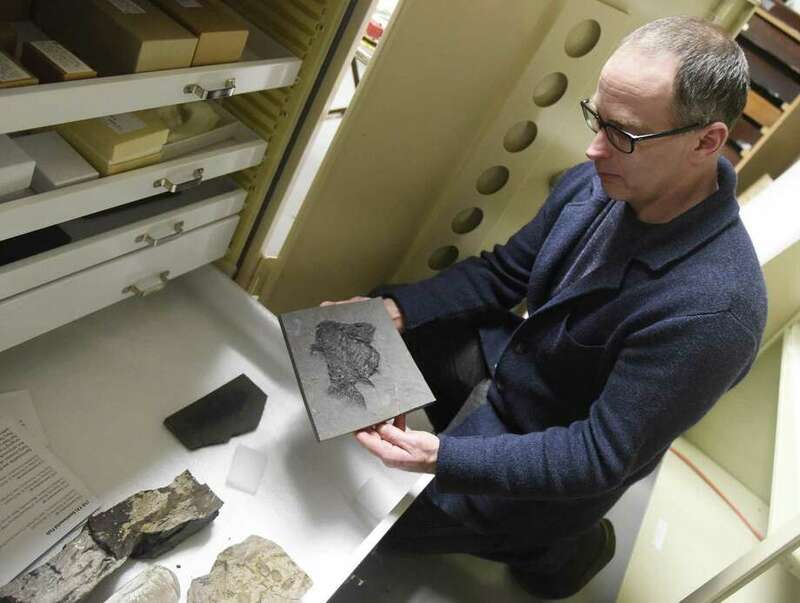 His passion led him to his undergraduate and graduate theses on ancient fish — discovering in 1970 that no research had been published on the subject since the late 1800s, and the most recent work on fossils in Connecticut had been done in 1911. He spent extensive time tapping black and red shale open to find almost perfectly preserved specimens in the sediment. McDonald’s fossil collection includes dinosaur footprints and teeth, fish, plants, invertebrates, rock samples and even coprolites — the preserved droppings of ancient creatures. “There are so many interesting specimens in this collection,” said Daniel Ksepka, Bruce Museum curator of science. “Everything from the skull of a giant coelacanth fish to ancient logs infused with copper. McDonald is the author of two books and has donated numerous specimens to other museums already — the American Museum of Natural History in New York, the Museum of the Earth in Ithaca, N.Y., Yale’s Peabody Museum and Connecticut’s Dinosaur State Park. But this donation is different, he said.